You can be assured that your Amana brand heat pump will provide you with quiet operation. To minimize operating sounds, we’ve acoustically engineered our systems with enhancements that include a compressor sound-reduction cover made of high-density foam and a specially designed sound-control top. Energy efficiency equates to cost savings. Your Amana brand AVZC20 Heat Pump offers up to 21 SEER energy-efficiency performance. “SEER” stands for Seasonal Energy Efficiency Ratio, a measure used by the U.S. Department of Energy to rate the cooling efficiency of heat pumps. The higher the SEER, the greater the efficiency—and the lower the operating cost. 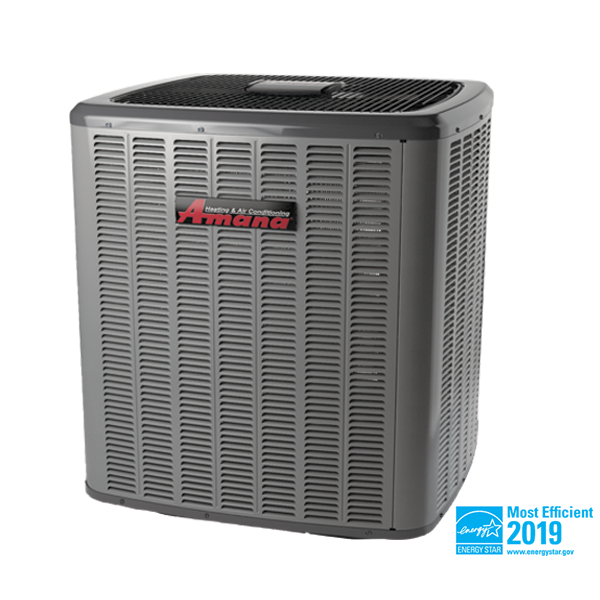 Compared to lower SEER units found in many homes, an Amana brand AVZC20 Heat Pump provides significant savings on your electric bill. Products that are recognized as the Most Efficient of ENERGY STAR® in 2019 prevent greenhouse gas emissions by meeting rigorous energy efficiency performance levels set by the U.S. Environmental Protection Agency.